This blogpost is a review of the communication “El emperador en la Constitución japonesa” read at the seminar “Japón: la posición del Emperador y el principio de igualdad en la Constitución” held at the Faculty of Law of the University of Barcelona on March 18 2014. The present Japanese Constitution was established in 1947, after World War II and was intended to replace Japan’s previous militaristic and absolute monarchy system with a form of liberal democracy. This Constitution has various characteristics. First of all, the Japanese Constitution provides for a parliamentary system and guarantees certain fundamental rights. Second, the Japanese Constitution, also known as “Peace Constitution”, is most characteristic and famous for the renunciation of the right to wage war contained in Article 9. Third, it states the sovereignty of the people and the Emperor of Japan is “the symbol of the State and of the unity of the people” and exercises a purely ceremonial role without the possession of sovereignty. In this seminar I talked about the Emperor system in the Japanese Constitution. The Emperor is called the Tennō in Japanese, which means “heavenly sovereign”. He is also referred to in English as the Mikado of Japan. Currently, the Emperor of Japan is the only remaining monarch in the world reigning under the title of “Emperor”. The Imperial House of Japan is the oldest continuing hereditary monarchy in the world. It was believed before World War Ⅱ that the earliest Emperor was Jinmu, who acceded to the throne in 660 B.C., recorded in Kojiki and Nihon Shoki, which are Japanese history books finished in the 8th century. If this is true, the Present Emperor is 125th since Jinmu. However, this is not historically demonstrable, because these books are largely legend and myth. It is said that the Emperor System was founded at the end of the 7th century according to present academic historical theories. The role of the Emperor of Japan has, historically, alternated between a largely ceremonial symbolic role and that of an actual imperial ruler. Since the establishment of the first Shogunate in 1192, the Emperors of Japan have rarely taken on a role as supreme battlefield commander, unlike many Western monarchs. Muromachi (1336-1573), Tokugawa (160-1867), were the de facto rulers of Japan, although they were nominally appointed by the Emperor. Japan was modernized, after the feudal System of the Tokugawa Dynasty was destroyed by Civil War in the 1860s. This Revolution is called “Meiji Ishin”. The new Japanese government took in the modern political, economic, and legal systems from Europe and tried to make the militarily and economically all-encompassing Nation State like European countries. Political leaders thought that the Emperor system was adequate to the integration of people to make up the Nation State. 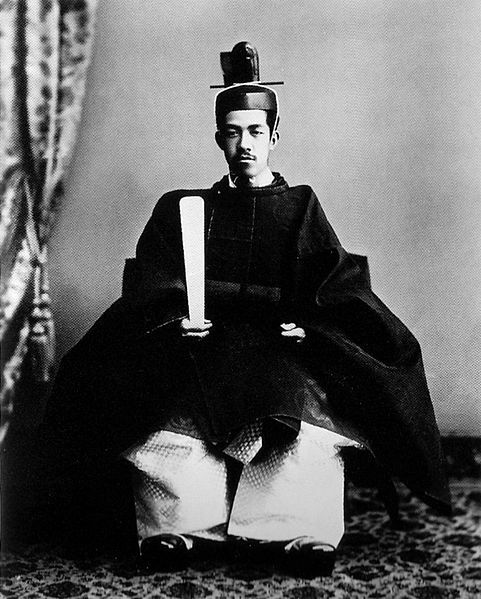 At that point the Emperor was, officially, the embodiment of all sovereign powers in the realm, under the Meiji Constitution established in 1889. Under the “Great Empire of Japan” that replaced the reign of the feudal Shogunate, the Meiji Constitution of 1890 consecrated the sovereignty of the Emperor according to divine principle. The constitutional status of the Emperor varied according to the times, yet the text remained untouched from 1890 until 1945. We indeed witnessed the rise of constitutional liberalism from the year 1900. Yet the experience of a government answerable to the Imperial Diet proved ephemeral, lasting only from 1924 to 1932. The remains of liberalism were finally and brutally extinguished in 1935 when the liberal constitutional doctrine of Minobe Tatsukichi, constitutional professor of Tokyo University was condemned as opposing the sacrosanct kokutai (Japanese proper political system), which signified the divine legitimacy of the Emperor, holder of all state powers. As for the imperial armies, they were, during the entire period of the application of the Constitution, placed beyond the supervision of the Government and, a fortiori, of the Diet; the armies, by virtue of the principle of “the independence of the military Command”，responded directly to the Emperor. The colonial rule of Korea and the invasion of the Chinese continent launched in the 1930s and the attack on the United States at Pearl Harbor were the direct consequences of the omnipotence of the imperial armies, which were able to crush all opposition in the name of the Emperor, “the loving deity” (Arahitogami). In the end, the Japanese Imperial State was defeated in World WarⅡ, the Japanese Emperor System caused the loss of numerous lives of people at home and abroad. It was thus natural, legitimate, and absolutely necessary for the Constitution of 1947 to change from the outset the two essential elements of the theocratic militarism of the pre-1945 Empire of the Rising Sun. Hence there appeared, on the one hand, the proclamations of popular sovereignty and of a symbolic emperor in lieu of a sovereign one, and, on the other hand, the renunciation of war and of armament. It also stipulates that “the advice and approval of the Cabinet shall be required for all acts of the Emperor in matters of state” (article 3). Article 4 also states that these duties can be delegated by the Emperor as provided for by law. Article 65 explicitly vests executive power in the Cabinet, of which the Prime Minister is the leader. For example, while the Emperor formally appoints the Prime Minister to office, article 6 of the Constitution requires him to appoint the candidate “as designated by the Diet” (in practice, the candidate designated by the House of Representatives), without any right to decline appointment. Also, the Emperor is not the (ceremonial) commander-in-chief of the Japan Self-Defense Forces, as in some other monarchies. The Japan Self-Defense Forces Act of 1954 explicitly vests this role as commander-in-chief with the Prime Minister. 1 Promulgation of amendments of the Constitution, laws, cabinet orders, and treaties. 2 Convocation of the Diet. 3 Dissolution of the House of Representatives. 4 Proclamation of general election of members of the Diet. 5 Attestation of the appointment and dismissal of Ministers of State and other officials as provided for by law, and of full powers and credentials of Ambassadors and Ministers. 6 Attestation of general and special amnesty, commutation of punishment, reprieve, and restoration of rights. 8 Attestation of instruments of ratification and other diplomatic documents as provided for by law. 9 Receiving foreign ambassadors and ministers. 3. What is the Japanese form of government? As we mentioned above, the Symbolic Emperor of the Japanese Constitution has no political powers. Then, what is the Japanese form of government, a republic or a constitutional monarchy? The Japanese constitutional theories are not clear. I think that Japan’s form of government is a republican constitutional monarchy. That is to say that the Symbolic Emperor system is a constitutional monarchy which resembles a republic very much. Because the Symbolic Emperor has no political powers and Article 1 of the Japanese Constitution states that “deriving his position from the will of the people with whom resides sovereign power”, Japanese people that have sovereignty may abolish the system of the Symbolic Emperor via a constitutional referendum. The political power of the Japanese people is far stronger than that of the Symbolic Emperor. In short, the Japanese governmental form is close to a republic. The conservative and authoritarian movement for constitutional revision, which appeared in the 1950s and is strongly prompted by the present government of Abe Shinzo who upon becoming prime minister, called for the revision of three essential points of the 1947 Constitution. The first demand was for the reinforcement of the status of the Emperor and for the weakening, if not the suppression, of the principle of popular sovereignty. The second demand was for an official rearmament, which runs counter to the celebrated pacifist Article 9.
system，which contradicted the notions of the dignity of the individual and the equality of the sexes enunciated in Article 24. These three demands of the revisionists of the Constitution are inextricably linked. I think that the Symbolic Emperor system, which has no political character, may determine whether or not Japan continues to preserve the democratic, liberal, peaceful and equal society in the future. [Article 1] The Emperor shall be the symbol of the State and of the unity of the people, deriving his position from the will of the people with whom resides sovereign power. [Article 2] The Imperial Throne shall be dynastic and succeeded to in accordance with the Imperial House Law passed by the Diet. [Article 3] The advice and approval of the Cabinet shall be required for all acts of the Emperor in matters of state, and the Cabinet shall be responsible therefor. [Article 4] The Emperor shall perform only such acts in matters of state as are provided for in this Constitution and he shall not have powers related to government. [Article 5] When, in accordance with the Imperial House Law, a Regency is established, the Regent shall perform his acts in matters of state in the Emperor’s name. In this case, paragraph one of the preceding article will be applicable. [Article 6] The Emperor shall appoint the Prime Minister as designated by the Diet. 1) Promulgation of amendments of the Constitution, laws, cabinet orders and treaties. 2) Convocation of the Diet. 3) Dissolution of the House of Representatives. 4) Proclamation of general election of members of the Diet. 5) Attestation of the appointment and dismissal of Ministers of State and other officials as provided for by law, and of full powers and credentials of Ambassadors and Ministers. 6) Attestation of general and special amnesty, commutation of punishment, reprieve, and restoration of rights. 8) Attestation of instruments of ratification and other diplomatic documents as provided for by law. 9) Receiving foreign ambassadors and ministers. 10) Performance of ceremonial functions. [Article 8] No property can be given to, or received by, the Imperial House, nor can any gifts be made therefrom, without the authorization of the Diet. [Article 9] Aspiring sincerely to an international peace based on justice and order, the Japanese people forever renounce war as a sovereign right of the nation and the threat or use of force as means of settling international disputes. [Artículo 1] El Emperador es el símbolo del Estado y de la unidad del pueblo, derivando su posición de la voluntad del pueblo en quien reside el poder soberano. [Artículo 2] El Trono Imperial será dinástico y su sucesión se realizará de acuerdo con la Ley de la Casa Imperial aprobada por la Dieta. [Artículo 3] Se requerirá el consejo y la aprobación del Gabinete en todos los actos del Emperador vinculados con el Estado, y el Gabinete será responsable de los mismos. [Artículo 4] El Emperador realizará únicamente los actos de Estado previstos en esta constitución y no tendrá otras facultades de gobierno. EI Emperador puede delegar la realización de los actos vinculados con el Estado según lo dispongan las leyes. [Artículo 5] Cuando, de acuerdo con la Ley de la Casa imperial, se establezca una Regencia, el Regente realizará los actos de Estado en nombre del Emperador. En este caso se hará aplicación del párrafo primero del artículo precedente. [Artículo 6] El Emperador nombrará al Primer Ministro, conforme a la designación de la Dieta. El Emperador nombrará al Presidente de la Corte Suprema de Justicia que designe el Gabinete. 1) Promulgación de enmiendas de la constitución, leyes, decretos del Gabinete y tratados. 2) Convocación de la Dieta. 3) Disolución de la Cámara de Representantes. 4) Proclamación de elecciones generales para los miembros de la Dieta. 5) Confirmación del nombramiento y remoción de los Ministros de Estado y otros funcionarios de acuerdo con la ley y de los plenos poderes y credenciales de Embajadores y Ministros. 6) Confirmación de amnistías generales o parciales, conmutación de penas, suspensión y restitución de derechos. 8) Confirmación de los instrumentos de ratificación y otros documentos diplomáticos de acuerdo con las providencias de la ley. 9) Recepción de embajadores y ministros extranjeros. 10) Realización de funciones ceremoniales. [Artículo 8] No pueden donarse bienes a la Familia Imperial, ni ésta recibirlos o hacer donaciones, sin la autorización de la Dieta. [Artículo 9] Aspirando sinceramente a una paz internacional basada en la justicia y el orden, el pueblo japonés renuncia para siempre a la guerra como derecho soberano de la nación y a la amenaza o al uso de la fuerza como medio de solución en disputas internacionales. Con el objeto de llevar a cabo el deseo expresado en el párrafo precedente, no se mantendrán en lo sucesivo fuerzas de tierra, mar o aire como tampoco otro potencial bélico. El derecho de beligerancia del estado no será reconocido.